Usually I do most of my cooking for the week over the weekend. This is a sensible strategy, except when it isn’t: sometimes grad school stuff piles up, or I’ve made more plans than usual, or I just need a break from the kitchen. At these times, it’s a joy to enter the weekend with something already batch cooked. 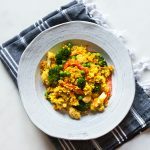 I prefer for it to be something that’s versatile enough for me to turn it into lunch or dinner, depending on my mood, something hearty and wholesome, and something so flavorful that I can enjoy the leftovers again and again without getting bored. This weekend, Richa Hingle’s Bombay potatoes & peas have me covered. 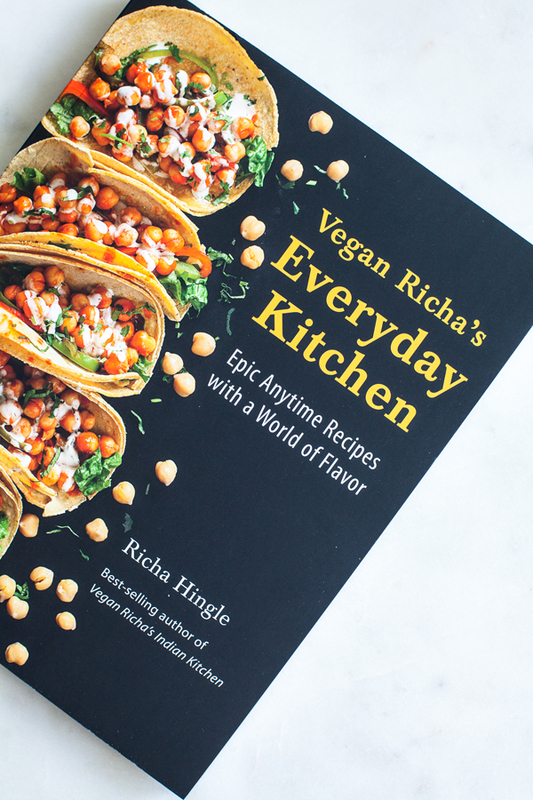 I don’t think Richa needs an introduction from me; her blog, Vegan Richa, is one of the most beloved vegan food resources on the web. Richa’s recipes are, in no particular order, accessible, playful, reliable, healthful, colorful, and comforting. Her first cookbook, Vegan Richa’s Indian Kitchen, taught me so much about authentic Indian food, including how to use carefully crafted spice blends for tempering. Richa’s new book, Vegan Richa’s Everyday Kitchen, channels some of the same techniques as her first. Once again, recipes are centered around spice blends and seasoning, but in this book the focus is explicitly on sauces. Richa calls these “awesome sauces,” and she uses them to simmer, sauté, and season creative mixtures of legumes and vegetables. 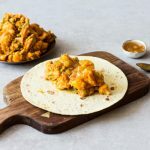 A small sampling of the awesome sauces on offer in the book includes Almond Sriracha Sauce, Buffalo Sauce, Butter Masala Sauce, Cauliflower Alfredo Sauce, Makhani Sauce, Peanut Butter Sauce, Smoky Cheese Sauce, and Tinga Sauce. There are many, many more, each marked with a special “awesome sauce” label. It’s such a smart technique for organizing a cookbook. Sauces are important in any cuisine, but I’ve always felt that they can do a special amount of heavy lifting with plant-based food, elevating seemingly simple plates of greens and beans and grains to new flavor heights. And Richa is a master of this process. The book is divided into sections according to sauces and their flavor profiles: peanut butter & coconut, sweet & sour, masala & saag, and buffalo & firecracker. Richa also has some chapters devoted to types of foods, like burgers and pizzas and desserts. I’m always struck by how intentional and precise Richa’s recipes are; you have the sense that they’ve been tested over and over, until they’re just right. And the recipes here are no exception. What I love most about the book is how flexible it is. Richa suggests making a couple sauces at the start of the week and using them in a number of recipes—either those she’s created, or other simple combinations. She also suggests mixing and matching sauces and the things they’re paired with in her book, and I can definitely imagine that it would be easy to swap, say, her peanut sauce for her butter masala sauce for her Red Lentils in Peanut Butter Sauce, or trade the Spinach Curry Sauce for Berbere Sauce with her Chickpeas and Potatoes in Spinach Curry Sauce. I’m excited to truly dig into all of the recipes, but I wanted to start with something simple, comforting, and and filling. I chose Richa’s Bombay Potatoes & Peas, which are made with whole mustard and cumin seeds, as well as coriander, turmeric, and lots of garlic in a rich tomato sauce. The dish has all of Richa’s flavor-forward, bold fingerprint, but it’s ready in about 30 minutes. 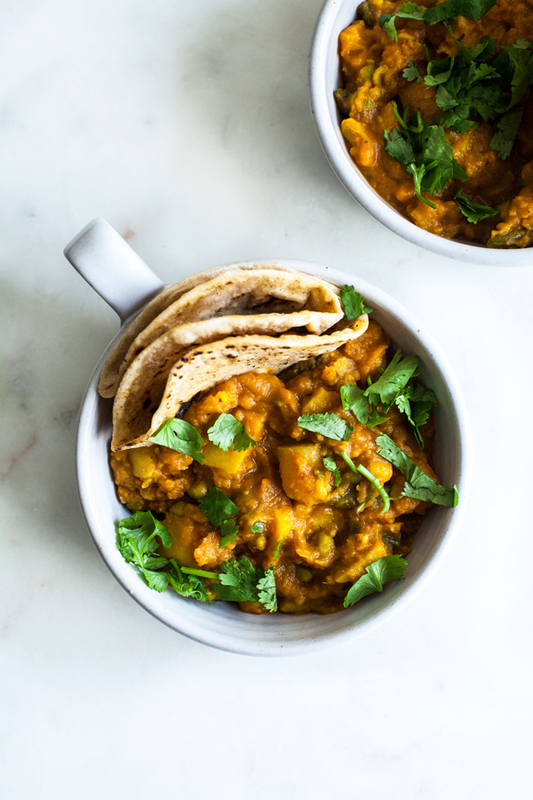 It’s a perfect versatile side, easy to pair with tofu or chickpeas, and it’s especially lovely for scooping up with flatbread. 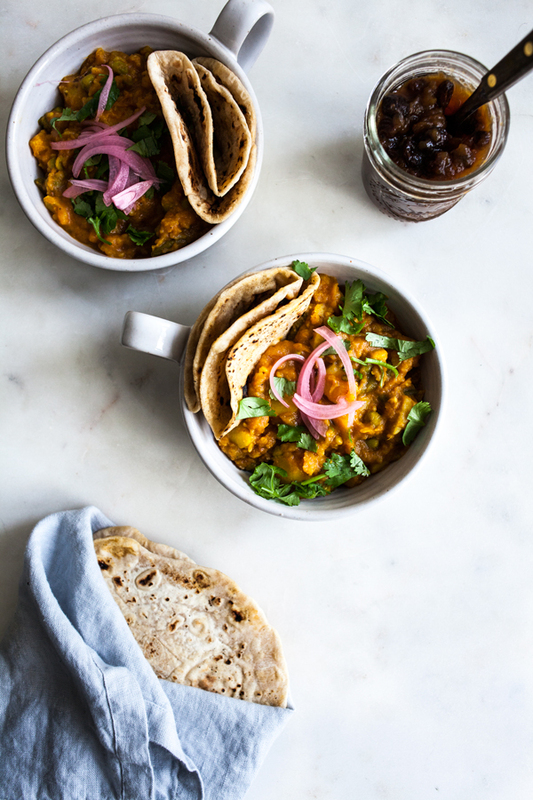 I chose to serve it with my homemade chapatis, quick pickled onion, cilantro, and some of my apple raisin chutney. But I’ve also got a pot of cooked basmati rice ready to go, so that I can serve it that way. I’d also love to try it with my creamy cashew raita. True to her words, Richa’s given me a super versatile, mix-and-match recipe, and I’m grateful to have it. Heat the oil in a large skillet over medium heat. Add the cumin and mustard seeds. Cook until the cumin seeds change color, 1 to 2 minutes. Add the onion and cook until it is translucent, 5 to 6 minutes. Meanwhile, in a blender, blend the tomato, garlic, and ginger into a coarse puree. Add the tomato mixture, turmeric, cayenne, coriander, ground cumin, and garam masala to the skillet. Cook, stirring occasionally, until the puree thickens and the garlic is fragrant, 5 to 6 minutes. Add the potatoes, salt, and water. Cover the skillet and cook for 10 to 11 minutes. Add the peas. Taste and adjust the seasonings. Reduce the heat to medium-low. Simmer for another 10 to 12 minutes, or until the potatoes are cooked to your preference. Add additional water if the potatoes start to stick or if you prefer more curry. Add the cilantro and lemon juice (if using). *I reduced garlic to 4 cloves. 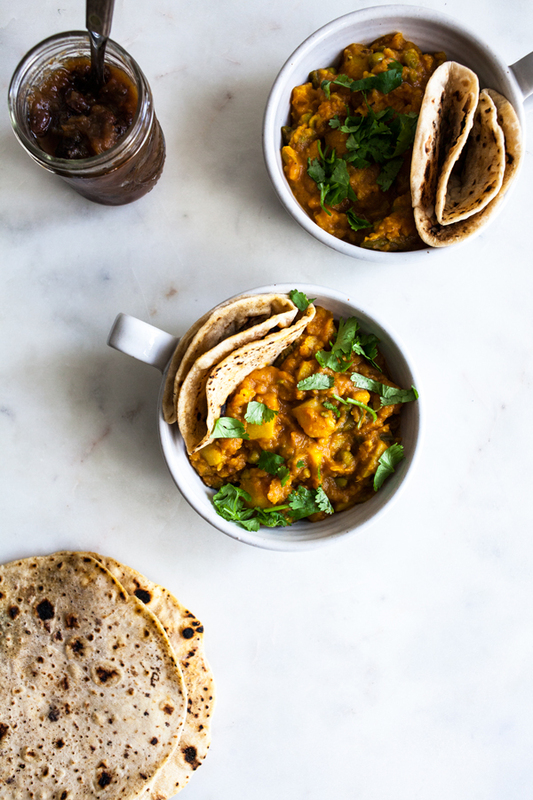 If you’re ready to welcome some of Richa’s signature sauces and easy plant-based recipes into your life, then I’m happy to tell you that Richa and her publisher are generously offering a giveaway copy of the cookbook to a lucky US or Canadian reader of this blog. You can enter below to qualify, and I’ll be picking a winner two weeks from today. I can’t think of better comfort food than a hearty bowl of potatoes and peas. I left my batch on the thicker side, cooking it down until it wasn’t at all soupy anymore, and I’ve been loving it that way (easier to scoop up with bread). But it’s easy to add more liquid for something that’s looser and better for pouring onto a hot bed of rice. No matter how you serve it, enjoy the recipe, and I’ll be back in a couple days with some links. This looks delish! I love homemade marinara sauce. Fresh tomatoes are the best! My favorite sauce is a garlic-packed tahini-based number, but I definitely want to expand my repertoire! I love a good hearty tomato sauce!! This sounds amazing, can’t wait to try it! I own her first book and love it. I can’t wait to check out this one! Thank you for the wonderful write up and review Gena. And the gorgeous photos of the bombay potatoes! I am glad you like the collection of recipes and the organization in the book. My favorite sauce is an Asian Peanut Butter sauce. What a great review of this book. I have Richa’s first book and would love to get a copy of this one. I haven’t made many homemade sauces but I’d have to say a version of pesto is one of my favorites for now. My favorite homemade sauce is pesto – so versatile! Two favorite homemade sauces: Dan Dan Sauce from The Splendid Table’s recipe for Dan Dan Noodles with Shiitake Mushrooms. And Vegan Fettuccine Alfredo using coconut milk from Vegan Yumminess’ blog. My fave homemade sauce is tahini but I need a change! This book sounds amazing! My favourite homemade sauce is cashew alfredo! I like making mine with the broth from dried mushrooms! My favourite is homemade mushroom gravy! I make a great homemade cheesy sauce! Looks incredible, think I’ll make this for dinner tonight. I too am in the thick of it with my final grad school class, and feeling under inspired and overwhelmed. Juggling kids, household, teaching, and writing a capstone. It’s comfort food like this that makes me feel warmth and content. My go to sauce is simple and tasty with so many things – potatoes, black beans, sweet potatoes, toast…it is a whole bunch of cilantro, one jalapeño (seeds and all), sea salt, juice of one lime, olive oil and enough water to make things all blend together. Richa’s recipes are so great! We can always do with more awesome sauces, so it’s really interesting that her book centers them. One sauce I’ve recreated from something I had tasted in a restaurant is a ginger-tahini sauce. It’s a wonderful flavor combo, and makes for a very versatile sauce! My favourite homemade sauce is a white sauce with mushrooms and garlic. We have always loved getting take-out from our favorite local Indian place near us, but it has been a long term goal to master home cooked Indian. You make it sound so manageable! This looks like such a wonderful dish to begin with, and I am imagining it would be so good with cauliflower as well. Your homemade chapatis look beautiful and makes the perfect accompaniment. I love a casserole! This potato and peas dish looks amazing can’t wait to try it! This recipe looks so warm and inviting, I can’t wait to try it. My favorite sauce would be mushroom gravy, so simple to make and goes great on mash potatoes. I’m a sucker for homemade marinara. Wow… This BOMBAY POTATOES & PEAS looks so delicious & amazing really. In so love with this recipe. I can’t wait to try my hand at this lovely recipe. Thanks for sharing this recipe with all of us. Looking forward to more amazing recipes like this. Best wishes and Regards. Hm, favourite homemade sauce would probably my mom’s fish sauce that’s used for vermicelli and other Asian dishes! I love vegan nacho cheese sauce. My fave homemade sauce is pesto, hands down. Thanks for the giveaway opportunity! Sort of homemade- I always loved the hot sauce my boss would make when I worked at a restaurant. I tried to recreate it but failed. Not sure how. It was pretty simple- just sweet peppers, hot peppers, beer, boiled, and pureed. I use that as a sauce and dressing. 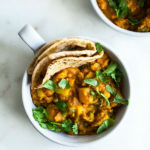 Finally a hearty vegan Indian dish I know I’ll enjoy. Thanks for sharing this is definitely my kind of comfort food too.